Should you move an Alzheimer’s patient if you are disenchanted with the facility? They give interesting examples for trying to resolve issues, which includes using a care manager or advocate. They also give examples on how to look for another facility. Make sure the facility is an actual Alzheimer’s facility. Many facilities advertise as such because they’re treating Alzheimer’s patients, when in fact they’re just a locked unit! 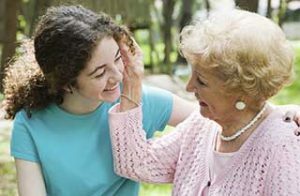 Make sure the staff has been trained specifically in working with Alzheimer patients, and ensure someone is certified as a trainer. Review their activities calendar and make sure the activities will meet your family member’s needs. Alzheimer’s is a progressive disease. As someone declines, activities should be offered that meet your family member on their level. And activities should offered at evening and night as well. Make sure patients can go outside in a safe setting. I personally know of a number of facilities in Western Pa where they’re unable to take their residents outside. If you follow these tips, you can rest assured that you’ve found the facility best suited to loved one’s needs. If you’re having difficulty with a facility after doing all of the prescreening, please contact us so we can help!